After many years of the long, convoluted and tragic English civil strife called The Wars of the Roses, the House of Lancaster had finally prevailed. Henry Tudor, the Welsh prince with Lancaster blood in his veins through his mother Margaret Beaufort, had defeated Richard III of York at the Battle of Bosworth Field in 1485. On January 18, 1486, Henry VII married Elizabeth of York, niece of Richard III and daughter of King Edward IV. Thus, the Houses of Lancaster and York were united and Henry began to bring stability and peace to England. Henry and Elizabeth’s first son Arthur was born September 20, 1486 and their second son Henry was born June 28, 1491. Henry VII’s claim to the English throne was dubious at best and some would call him a usurper. In trying to secure his position and increase the strength of the country, he looked for brides in foreign markets to marry his children. 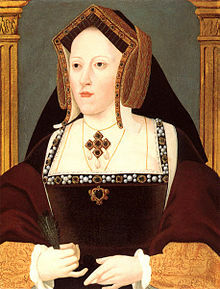 His choice of a wife for his eldest son Arthur was Catherine of Aragon. Catherine of Aragon was born on December 16, 1485 near Madrid. She was the youngest child of King Ferdinand II of Aragon and Queen Isabella I of Castile. She was given a strong education in the classics, literature, canon and civil law and could speak Spanish, Latin, French and Greek. She also was brought up strictly in the Catholic faith which would play a large part in her life and fate. At the age of 3, she was betrothed to Arthur, Prince of Wales. In 1489, English ambassadors visited the court of her mother to finalize the terms. Catherine came to England in November 1501 and met her groom for the first time. They were married 10 days later and immediately sent to live in Ludlow in Wales. In April of 1502, they both became ill, possibly of the sweating sickness. Arthur died and Catherine survived as a widow. Henry VII did not want to return Catherine’s dowry to her father so it was agreed Catherine would marry Arthur’s brother, Prince Henry when he was old enough. Catherine spent the next seven years, virtually a prisoner and in complete penury. Henry VII gave her little to live on and her pitiful pleas to her father for money survive in her letters. She was forced to sell the plate and jewels she had brought with her when she married Arthur. Henry VII finally died in the summer of 1509 and Catherine was free to marry the golden prince Harry. Catherine and Henry VIII were married June 11, 1509. They were crowned together at Westminster Abbey on June 24. Catherine was 23 and Henry was just 18. The marriage was very successful in the beginning. Catherine and Henry were intellectual equals and enjoyed many pastimes together. They read, played music, danced, and had many deep discussions. Catherine immediately became pregnant and had a stillborn son in January 1511. Another son was born on New Years Day of 1511 but only lived 52 days. Catherine would become pregnant many times but only one child survived childhood, the Princess Mary, born February 18, 1516. Catherine continued to deepen and broaden her education as well as that of her daughter. Educating women became fashionable during this time because of her. Catherine also served as Regent of England when Henry went to war in France in 1513. While Henry was away, his army in England defeated the Scots at the Battle of Flodden Field. It was a great victory under Catherine’s watch. By 1525, the captivating Anne Boleyn, one of Catherine’s ladies-in-waiting, had thoroughly bewitched Henry. He was beginning to believe his marriage to Catherine was cursed due to the lack of a male heir, because Catherine had been married to his brother. From 1526 to 1533, Anne spurned all of Henry’s romantic advances. She didn’t want to become the King’s mistress, like her sister Mary Boleyn had been. And her family, the powerful Howards, wanted her to become Queen to advance their interests. It was during these years Henry asked Catherine for an annulment of their marriage which she staunchly refused to do. In her eyes, her marriage to Arthur had never been consummated and due to her Catholic faith, she was truly Henry’s wife. Also, an annulment would bring into question the legitimacy of her daughter Mary and limit or end her chances of inheriting the throne. All this led to a stalemate. Once Anne relented and gave in to Henry, she became pregnant and forced his hand. Since the Pope wouldn’t grant Henry an annulment of his marriage to Catherine, he decided to divorce himself from the Catholic Church. He made himself Head of the Church of England allowing the Archbishop of Canterbury to declare Henry’s marriage to Catherine null and void. Henry then married Anne Boleyn. From this point on, Catherine was basically under house arrest. She was moved from castle to castle and not allowed to see her daughter. Her servants were reduced to the minimum and she had little money for food or clothing and finally succumbed to illness in January of 1536. It is said when they did an autopsy, her heart had a black mass in it. It wouldn’t be a stretch to say this proud Spanish princess died of a broken heart. 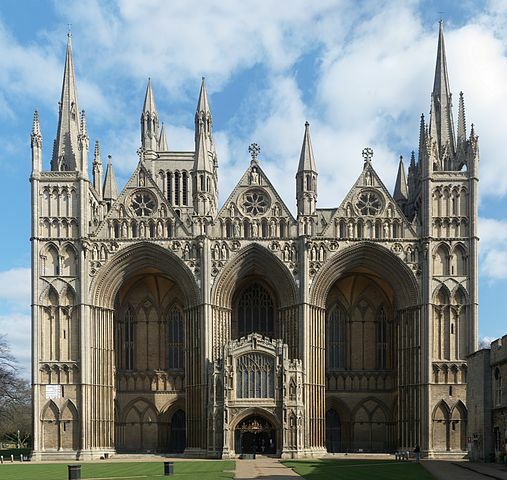 She was buried in Peterborough Cathedral in Peterborough, Cambridgeshire. 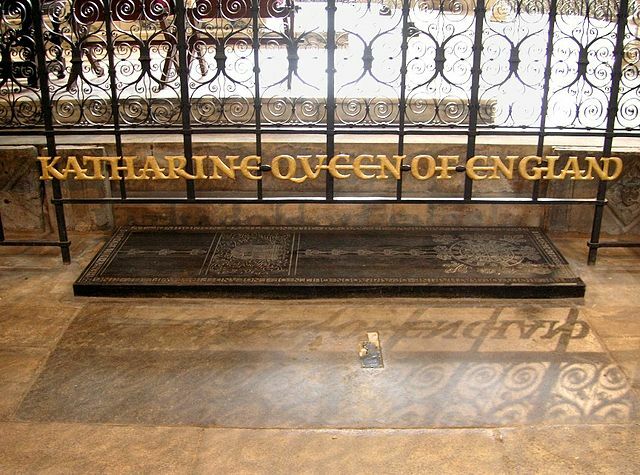 I know spellings were not as important in Tudor times, but why if her burial place is spelt with a K has no-one adopted this final spelling of her name? The spellings are interchangable. Her name was Caterina in Spanish so that is where the “C” spelling comes from. In English the name is spelled with a “K” so this is probably why it is spelled that way on the grave. A very honest and faithful recording of history. Well done, Susan. Excellent — concise and interesting! Thanks very much. So glad you liked my blog on Catherine of Aragon. Keep reading for more on Henry’s wives. Concise and informative. I love the Tudor era! I love the Tudor’s too Diane! Keep reading. I’ll post Anne Boleyn in the next couple of days.